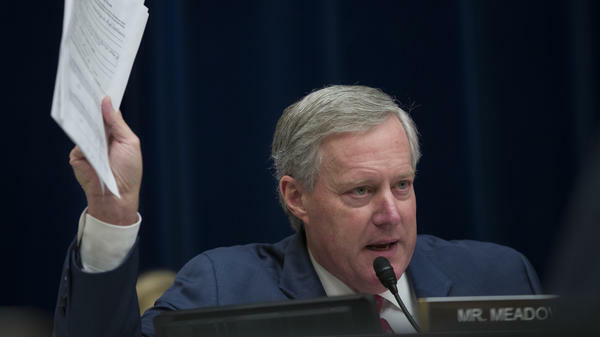 Rep. Mark Meadows, R-N.C., questions Michael Cohen, President Trump's former lawyer, as Cohen testifies before the House oversight committee on Wednesday. Meadows had a heated exchange with Rep. Rashida Tlaib, D-Mich., during the hearing. A spokesman for Tlaib has not responded to NPR's request for comment on her take on the exchange. During the House Oversight Committee's hearing to take testimony from President Trump's former personal lawyer, Michael Cohen, Meadows brought Lynne Patton, an African-American woman who works in the Trump administration at the Department of Housing and Urban Development, to refute Cohen's allegations of Trump's racist behavior. Tlaib, a freshman, was one of the last lawmakers to question Cohen and used part of her time to admonish Meadows for doing so. "Just because someone has a person of color — a black person working for them does not mean they aren't racist," she said Wednesday, "And it is insensitive that some would even say — the fact that someone would actually use a prop — a black woman — in this chamber, in this committee is alone, racist in itself." House Oversight Committee Chairman Elijah Cummings, D-Md., citing a personal friendship with Meadows, mediated the dispute by having Tlaib clarify she saw the act as racist, not the congressman. Meadows would not say Thursday if he regretted bringing Patton as his guest to the hearing. "I'm not going to get into analyzing everything, obviously at this particularly point it is critically important that people know each others' motives and heart and I think that we understand each other," he said. The exchange led Democratic activists to resurface and circulate online a 2012 video of Meadows saying "we are going to send Mr. Obama home to Kenya or wherever it is," which is widely acknowledged as playing on racist, birther conspiracies levied against Barack Obama. President Trump engaged and popularized birther conspiracies for years before acknowledging it was false during his 2016 campaign. "Listen, that's old news. I've addressed that dozens of times and candidly apologized for that a number of times," Meadows told reporters Thursday regarding the 2012 video, "It was when I was running for office, I answered a question. I actually had just gotten back from Kenya where we had been doing mission work in Kenya. Anybody who knows me knows I look to show respect regardless of race or gender or anything that would indicate that there would be a racist motive for me is just not accurate."